We’re sitting down with Maryland’s 3 Dice Ceno. Let’s get right to it – What’s your story? 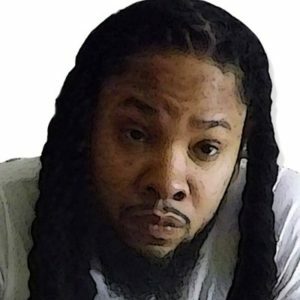 I’m a Washington D.C born living out Montgomery County till 5 yr old, then Miami/South Broward raised artist, now out Maryland from being out Baltimore for 3 years and some change back in 2005 to 2009 with Mental Head Bangerz put together by General Beats.My story starts with me being not really into hip hop/rap music until i was round 13-14 yrs old. I had more a thing for art in terms of drawing pictures now it speaking its speaking them as if they painted on a canvas talking on situations like in ” American Evil ” prod by Iron Lung where i talk about how evil is installed by america’s everyday movement in terms of how it does about its whether the bullying is physical or verbal said through stereotype, racism, environment, displays of police brutality, applying mental restraint. I was taken in by the streets and taught how i should go about myself and a dollar cause i would be shown how at the end of the day all i got is me cause they don’t share goals and intention.My story come from mother and father separation, mother moving to miami and me later having gone through experiences. How were you raised, what achievements have you had in your life? I was raised by the up in age within my group setting that motivated growth that would later seek achievements in things that would help me advance in my goals like opportunity. Looking at my craft more as an investment and this music as a business. Gotta take yourself serious before others does. What artists and styles most influence your overall sound? I listen to certain artist every now and then but what influences me more is me everyday and however I’m feeling at that present moment. Can you describe your creative process and your recording set up for us​? To describe my creative process is me basically listening to a beat and letting the the subject matter and concept come to me,and without pen or pad speaking what the song would be . Sometime i have had subject matter and concepts just going about my day. i gotta home studio. Basic M-audio, Sonar program, and mic and i send it off to my engineer. What do you add to the rap genre? What do your songs say about you as a performer? I bring back that raw storytelling hip hop .When i perform my songs basically say i’m dice (Dangerously imbalanced cording to his environment) like another black male in what environment or situation.The fact that i’m no different .The only difference is the style i choose. What differences do you perceive that there are between the rap scenes in various cities through the United States? The difference in the various rap scenes in the cities i been is the reach of certain genres over others.The grinds are also different especially if you break it down in individual artists one might go about his/her music with brings variety that is needed in mainstream music now. You have a very distinctive vocal style/wordplay; how do you think you have evolved since your earliest tracks? Yes, i feel i have due to the fact i always feel i could have done better than the last so it becomes something i push forward in doing, but i appreciate the fact that you noticed my distinct style i try to distinct slang within my wordplay with different vocabulary which many times make a punchline go unnoticed but the bars on the track go smoother. i once skimmed through this book called Speech that spoke on the different formulas of speech used by scholars, poets, debaters, and lectures who gave information in a diverse way of speaking and try to apply that within my music as much as possible which is a sound you can hear more in tracks like ” Pacasso ” prod by Iron Lung and ” Broadway George ” prod by Soviet Beats. How can interested readers find out more about yourself? Any interested reader can find out more about me on SoundCloud ; I just put up a track collaboration with Hell Rza called ” 444 Redux Raw Cut ” which is mostly freestyled and also a track called “Social Baddie ” prod by.Iron Lung. 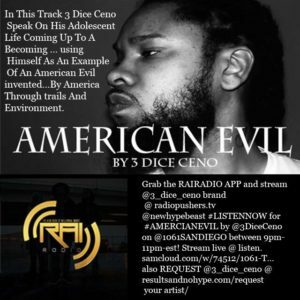 Also “American Evil”, ” Pacasso “, “Social Baddie “, and ” Geisha #9 ” on iTunes, Apple Music, and Spotify. You find me on Instagram under @3_dice_ceno. My Facebook is Dice Ceno and Facebook Fan Page is 3 Dice Ceno. I’m on Digiindie.com as a featured artist and a artist on Digiindie’s Radio Mixtapes. I’m on the Wu-Invasion Vol.1 hosted by GhostFace Killah a mixed by Dj Symphony we just did 5 million in downloads and counting at the same time working on some with Dj Symphony at this present time. You can find me on SkillyOnline.com, Locked Magazine, Music Now Magazine, and Rudeboymag.com. What has provided more of your fans – Facebook / Instagram / ReverbNation / Spotify or traditional word of mouth? Facebook and instagram most definitely im new to Spotify so i’m still learning my way around the platform,Word of mouth is what i’m working on more now as far as flyers, cds and other merch so till i get that situated its showcases and flyers. What does the rest of 2018 hold for you? I’m getting ready to do music videos, photoshoots, and networking to to merge my brand with other ventures. Thank you so much for your time. Do you have any final thoughts for us at NeuFutur? No,not really just the fact that i appreciate the opportunity of being able to speak with you on the subject of my music and how i’m trying to move further with that.